There still exists a latent potential for America to act as a world leader on Climate Change, said Dr Hugh Atkinson, in his double event of a seminar and a book launch at London South Bank University (LSBU) on 8 February 2018. The book launch unveiled Dr Atkinson’s latest book, The Politics of Climate Change under President Obama. 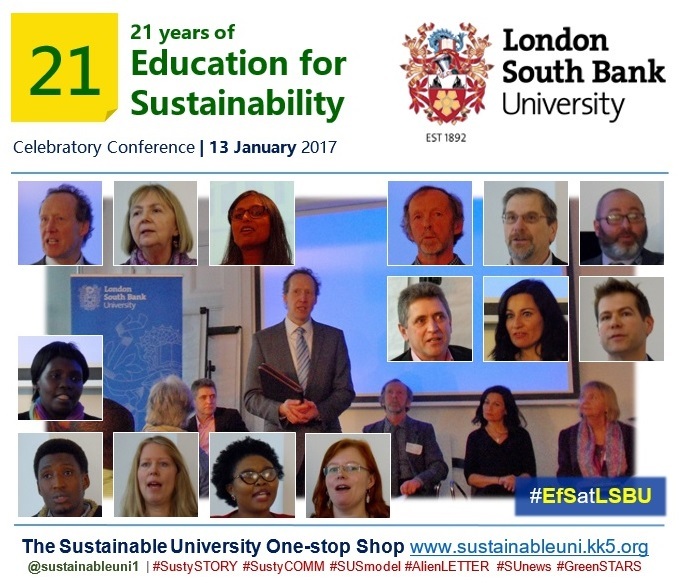 Professor Patrick Bailey (Deputy Vice Chancellor and Chair of the Sustainability Steering Group LSBU) delivered the welcome speech. Talking about his book, Dr Atkinson placed the evolution of US policy within broader debates on the politics of climate change in the USA. He was optimistic, stating that there still exists a latent potential for America to act as a world leader on this issue. 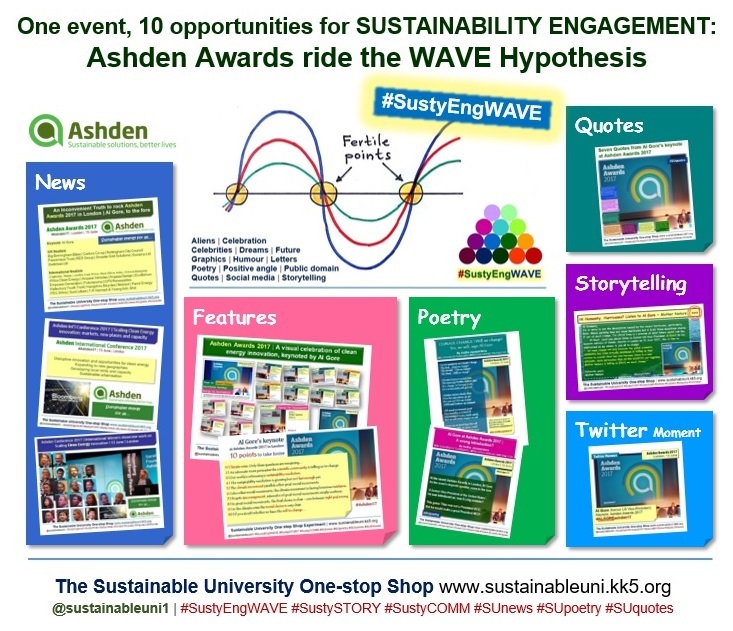 Dr Hugh Atkinson is Senior Lecturer in Politics and Public Policy at LSBU, a tutor on the Education for Sustainability (EfS) programme and a Management Group member of the London RCE (Regional Centre of Expertise) on ESD (Education for Sustainable Development), which is based at LSBU. 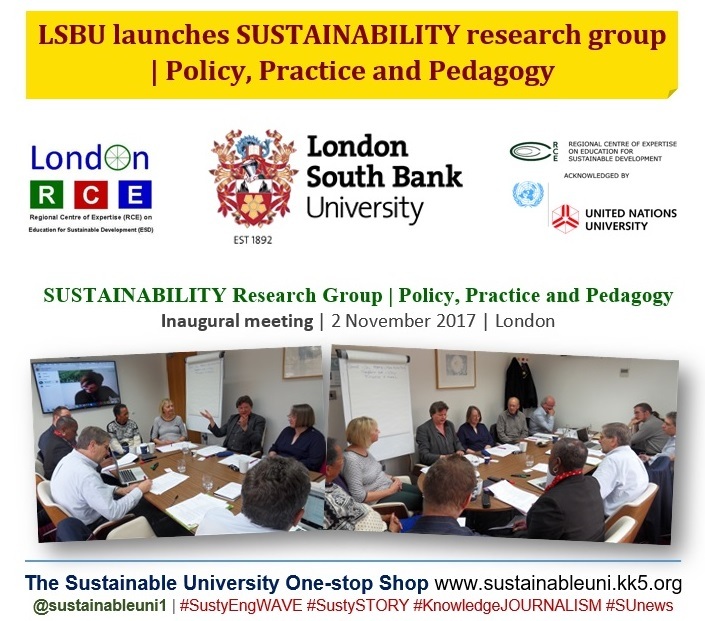 The second meeting of the LSBU research group ‘SUSTAINABILITY: Policy, Practice and Pedagogy’ was held before this double event. Is the education that we are providing adequate to face the challenges that we are facing today? 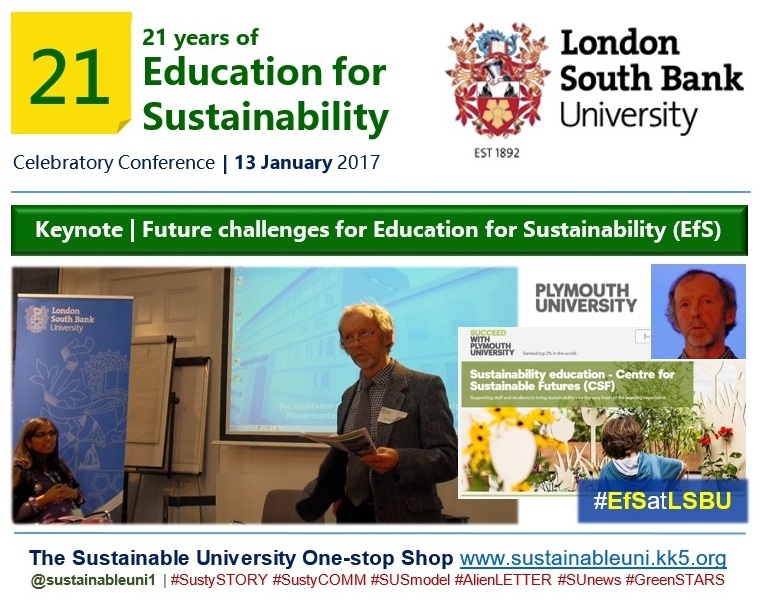 asked Professor Stephen Sterling (Professor of Sustainability Education at the Centre for Sustainable Futures, Plymouth University) in his keynote speech at the 21st anniversary celebratory conference of the EfS programme at London South Bank University (LSBU) held at LSBU on 13 January 2017. Titled ‘Celebrating 21 Years of EfS: Moving forward in an age of global uncertainty’, the event brought together academics, students, alumni and practitioners, who collectively reflected on the impact of EfS and looked forward to future developments in this important field of education. The programme featured a keynote, talks, panel discussions, workshops, stories from current students and alumni of the course, a poster exhibition and a celebratory reception. Welcoming the participants, Professor Patrick Bailey (Deputy Vice Chancellor LSBU) highlighted that sustainability is so complex that no single area of expertise can solve the wicked problems associated with it, emphasising the need for an interdisciplinary approach. 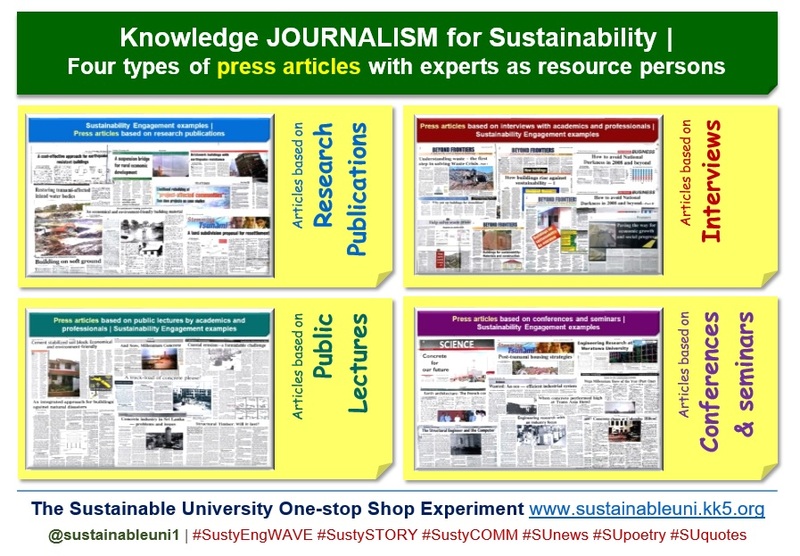 He said that it is social justice that needs to be at the heart of sustainability, so that everything else would follow, even environmental protection. He revealed that he doesn’t believe in climate change because it is not a religion and that, like himself, we all should become climate change critics. He said that there is 98% certainty that climate change is happening and 95% certainty that it is human-driven and warned that the consequences of not taking this clear evidence into account would be very serious. He congratulated the outgoing course director, Professor Ros Wade, who had been at the helm of the course for the last 21 years from the very beginning. Dr Jaya Gajparia, the new director of the EfS programme, gave an overview of the course. She said that the EfS course, which offers postgraduate courses from Continued Professional Development (CPD) to Masters level with a range of flexible study modes, including distance learning, spans the theory and practice of EfS, enabling students to explore and expand the role that EfS can play in educational, social, political and economic change. 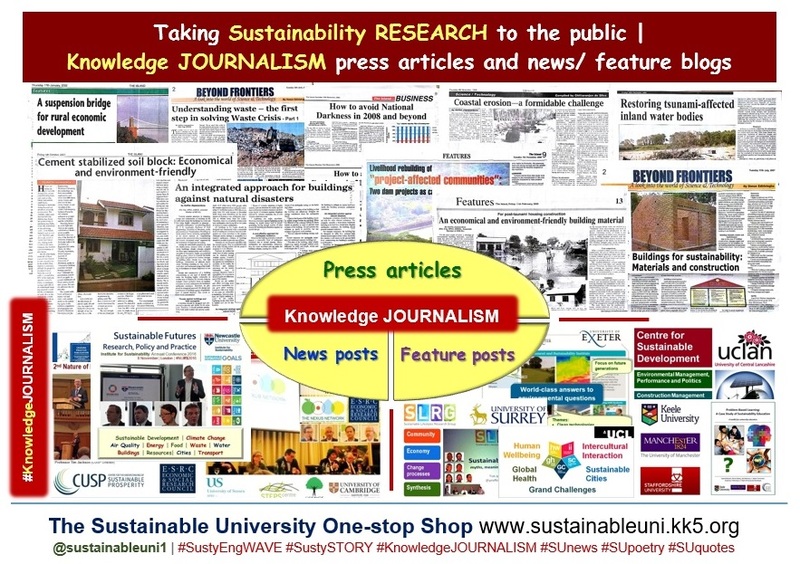 She also said that the course, which is designed for anyone interested in paving the way for a more sustainable world by way of understanding, educating or promoting sustainability, comprises six modules, with case studies and readings from a range of global regions; they are designed to be applicable to any type of educational or country context. 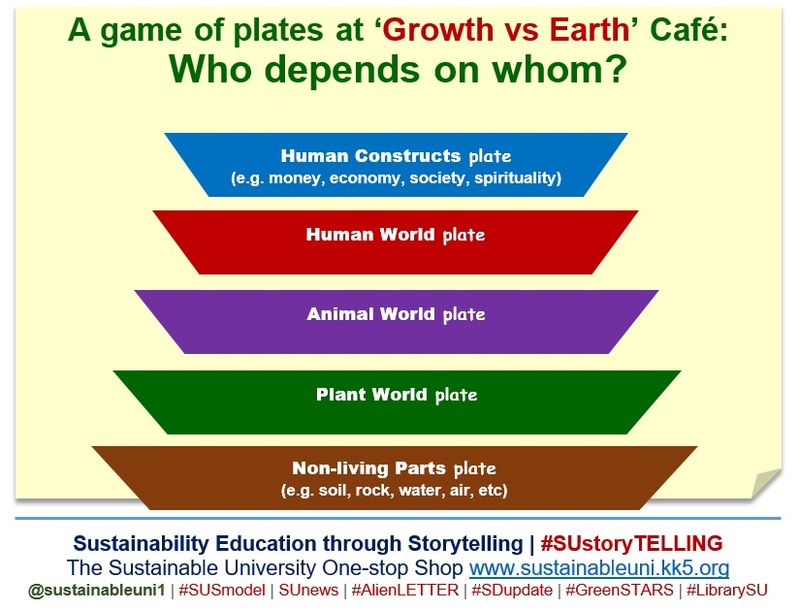 Moreover, she talked about the roots of the course, which lie the 1992 UN Earth Summit in Rio, Brazil, where a commitment was made to integrate environmental and development concerns in the emerging concept of sustainability while emphasising the importance of education’s role in building a sustainable world. 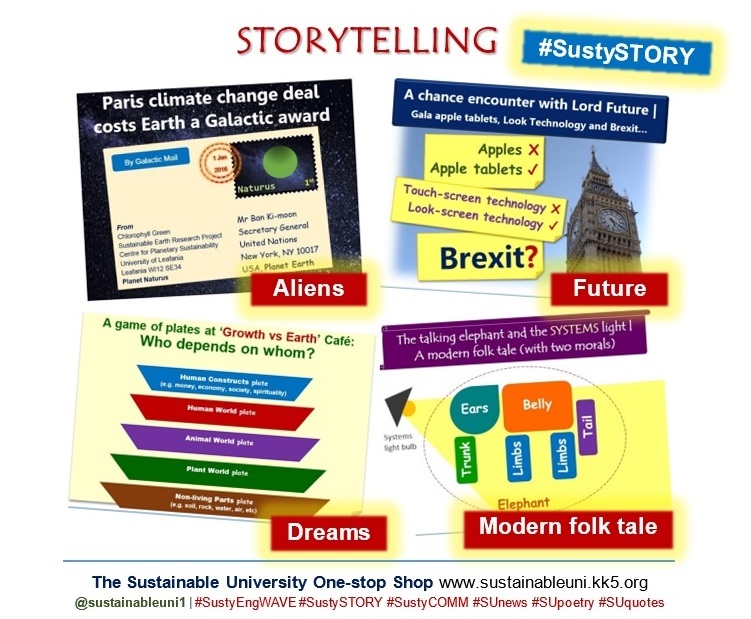 In response to this, she said, a group of development and environmental organisations – with the financial contributions from WWF-UK, Oxfam and the EU – got together with LSBU and the eventual result was this EfS programme. Finally, she observed that, over the last 21 years, the world’s first ever Masters programme of this kind has continued to grow steadily as a dynamic interface between theory and practice in EfS, with students and alumni from all continents – except Antarctica! The panel, chaired by Professor Stephen Sterling (Plymouth University), comprised Professor Ros Wade (LSBU), Dr Paul Vare (University of Gloucestershire), Betty Okot (Alumni from Uganda/ Keele University), Safia Minney (People Tree) and Professor Craig Barker (LSBU). The panellists answered the chair’s questions and then, in the end, questions from the audience. Professor Ros Wade, outgoing course director, observed that this EfS course has been a collaboration from the very beginning – between environmental and development educators, between academia and NGOs and so on. She said that EfS not being a fixed discipline or field, the course has been developed in line with solving real world problems, based mainly on practice, enabling students to explore and expand the role of EfS in their own personal and professional journeys. To her, transformatory aspect is key to the course although which brings in tensions, such as allowing for transformation, emergence, openness and originality vs. learning outcomes. She revealed that it was people who made the course a resounding success, especially the students. 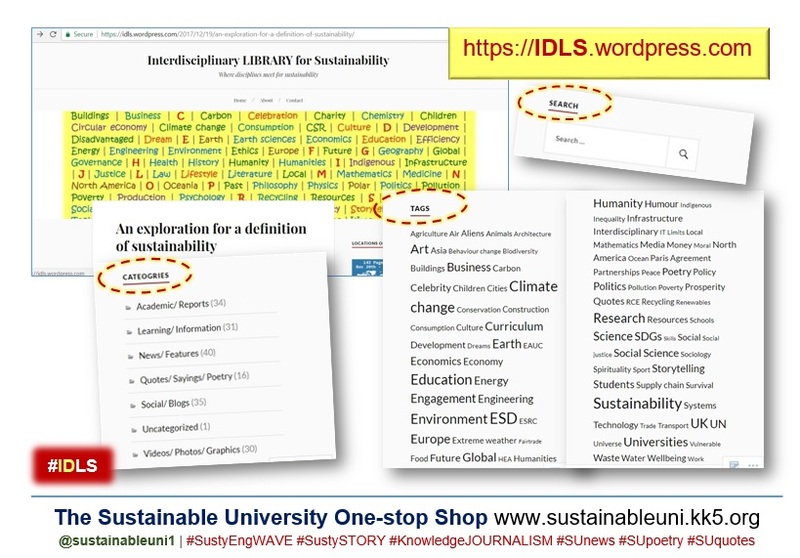 She also mentioned Journeys around Education for Sustainability, the book that the course published in 2008 from the work of the course participants and directors. Betty Okot (Keele University), an alumna from Uganda, talked about how the EfS course made her a confident agent of change, elaborating on her work in making positive change in community policing in Uganda. Dr Paul Vare (University of Gloucestershire) emphasised that the economic goal is too narrow for education and that critical thinking should play a key role of education. Safia Minney (founder of People Tree) suggested that more pressure should be exerted on governments and corporations to battle modern slavery and that the movie ‘True Cost’ should be shown to teachers. Professor Craig Barker (Dean, School of Law and Social Sciences, LSBU) said that many countries takes responsibility seriously but international law is constrained by political will. The session on the impact of the course was chaired by Dr Glenn Strachan (LSBU), who himself was a student on the course and then a co-director. 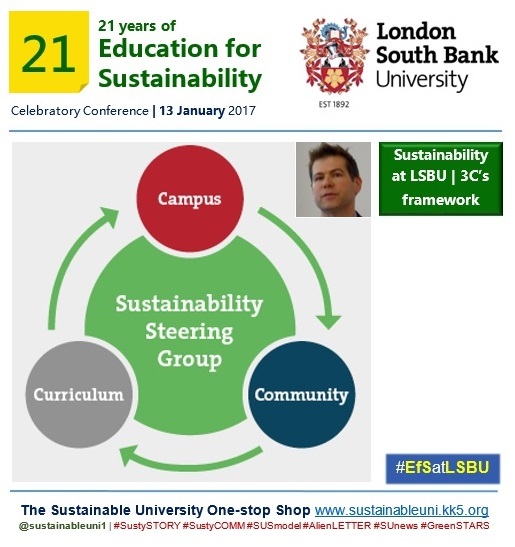 James Whittingham (Sustainability Manager at LSBU) outlined the university’s 3C-framework that drives sustainability change by addressing both hearts and minds of the LSBU community; the framework comprises campus, curriculum and community. Students’ posters were on display during the lunch break. ‘Whole Earth?’ exhibition, launched in autumn 2015 at the Eden Project, is hosted by universities and schools in the UK and Scandinavia. 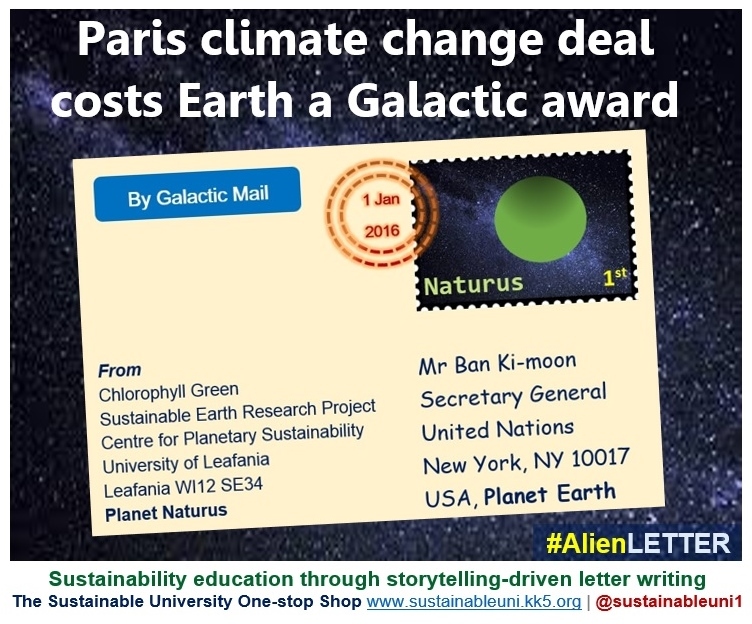 It is a partnership between Hard Rain Project, the National Union of Students (NUS) and the Environmental the Association of Universities and Colleges (EAUC). Two representatives from the UK Commonwealth Scholarship Commission, which funds the African Scholarship programme of the course, outlined its contribution to sustainable development and empowerment through its scholarship scheme. 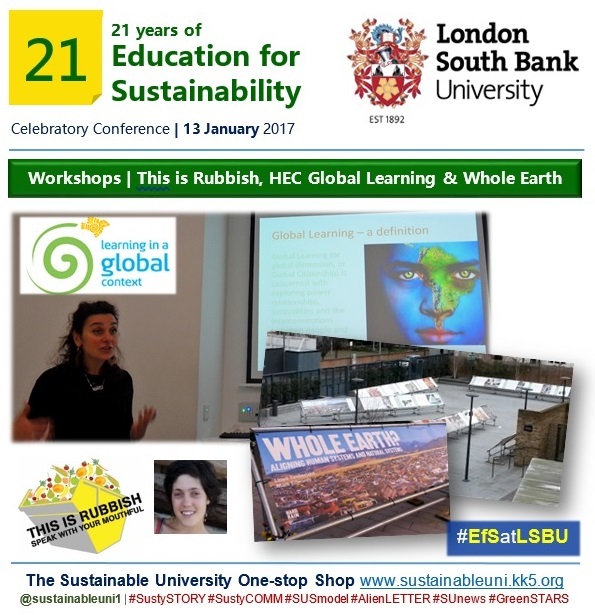 Professor Ros Wade (Chair, London Regional Centre of Expertise RCE in Education for Sustainable Development ESD) revealed how the existence of the course at LSBU was instrumental in the development of LSBU as the host of the RCE London, which is part of the UN University’s global RCE network. 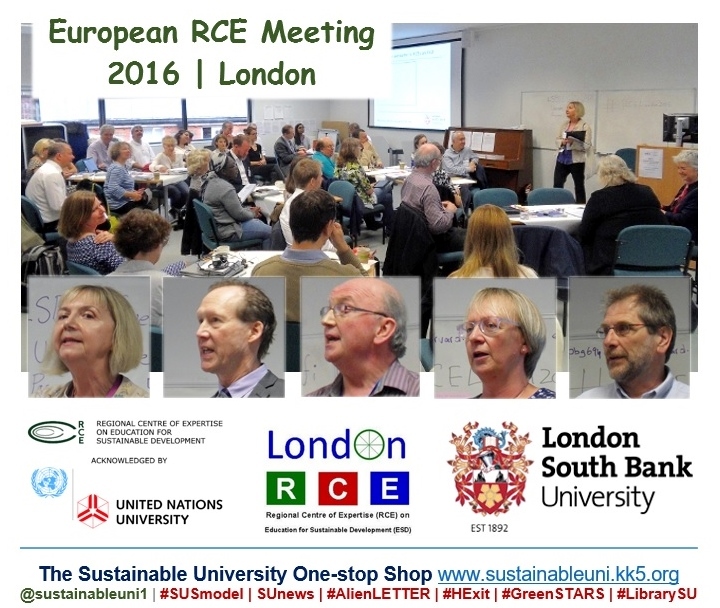 She drew attention to the European RCE meeting 2016 that RCE London and LSBU hosted in June last year. What’s wrong with education today? Is the education that we are providing adequate to face the challenges that we are facing today? asked Professor Stephen Sterling, delivering the keynote on the future challenges for EfS. Today, conventional knowledge is not adequate, he observed, emphasising that extraordinary times require extraordinary responses. 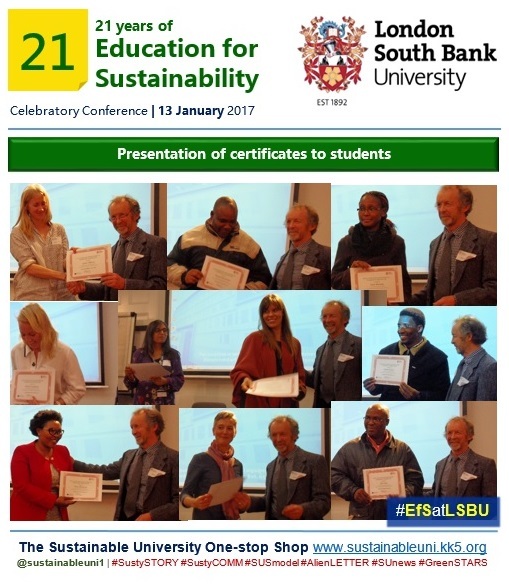 He viewed the birth of this course as an example of such an extraordinary response from environmental and development education communities. Good education should enable us to question assumptions, including our own, as this course encourages its students to do so, he said. Future challenges for EfS are numerous, he said, taking tension as an example, between fragmentation and integration. Other challenges that he had mentioned include staying within fixed boundaries, issues related to labels and identities and obtaining better co-evaluation with society. Although much more needs to be done, what EfS/ ESD (Education for Sustainable Development) has achieved in the last couple of decades is phenomenal, he observed. For instance, he said, in the 1990s EfS/ ESD was almost non-existent but today it enjoys global influence at the UN level. After the keynote, Professor Sterling awarded certificates to the students who had participated in a recent residential of the course. The day ended with a celebratory reception. Note: All logos and screenshots are from respective websites. 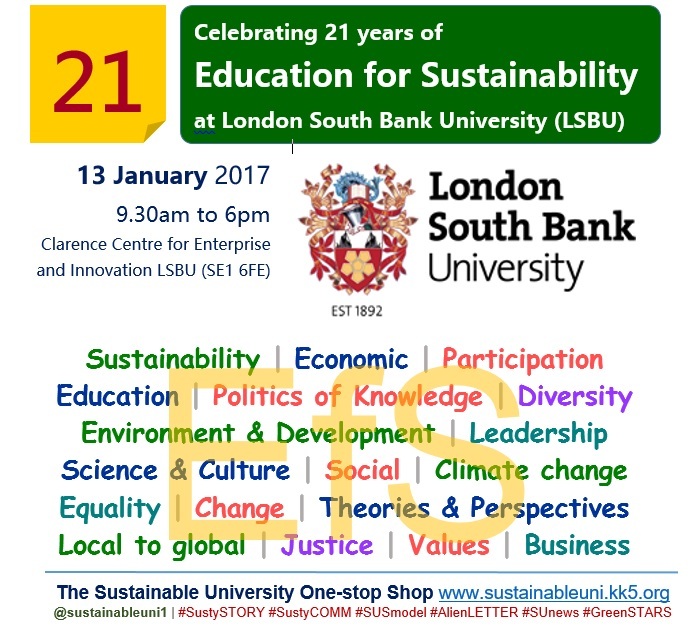 The 21st anniversary celebratory conference of the Education for Sustainability MSc programme at London South Bank University (LSBU) will take place at LSBU’s Clarence Centre for Enterprise and Innovation (SE1 6FE) on 13 January 2017 from 9.30am to 6 pm. 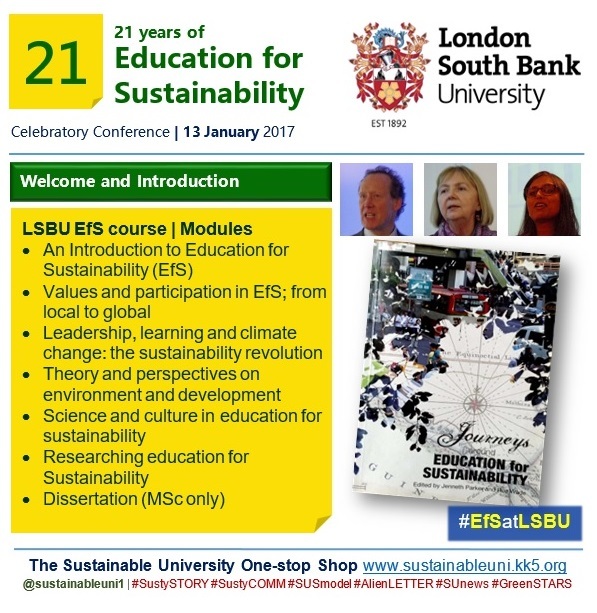 This free event will celebrate 21 years of Education for Sustainability MSc at LSBU, reflecting on the impact of EfS and looking forward to future developments in this important field of education. It will feature a keynote, talks, panel discussions, workshops, stories from current students and alumni, a poster exhibition and a celebratory reception. 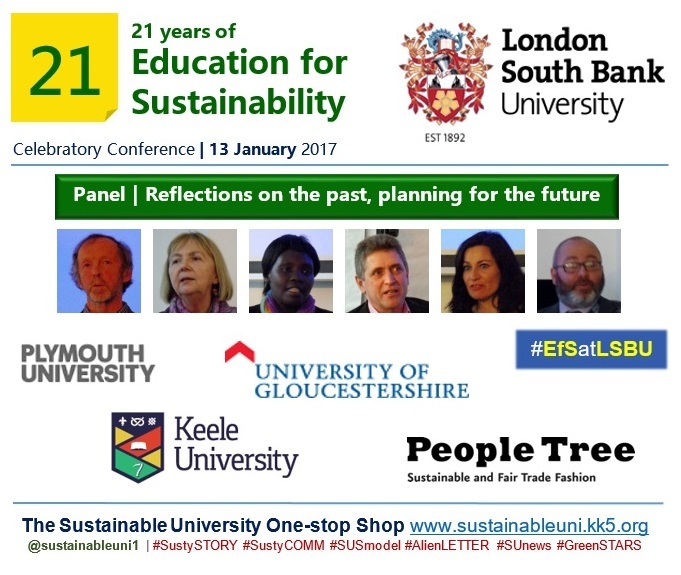 Professor Stephen Sterling, Professor of Sustainability Education at the Centre for Sustainable Futures, Plymouth University, will deliver the keynote speech on the importance of Education for Sustainability (EfS) work in an age of global uncertainty. 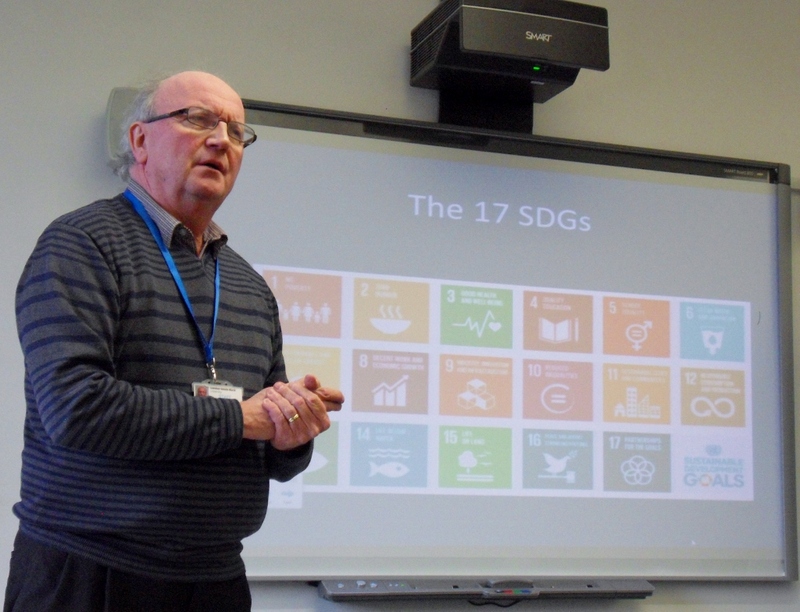 A former Senior Advisor to the UK Higher Education Academy on Education for Sustainable Development (ESD), and a National Teaching Fellow, Professor Sterling has worked in environmental and sustainability education in the academic and NGO fields nationally and internationally for over three decades, including as a consultant and advisor on UNESCO’S ESD programmes. Safia Minney, the founder of People Tree, will speak to us about her work, the challenges and barriers we face today and the role of education in creating social change. Well-known in the Fair Trade movement, Safia is recognised internationally as the pioneer of sustainable fashion and as an Outstanding Social Entrepreneur by the World Economic Forum. Safia launched Global Village in 1991 in Japan, out of which People Tree was born, and then in London in 2000. People Tree was the world’s first fashion company to achieve organic and Fair Trade certification. Naomi Namara Karekaho, an alumna from Uganda, will share the impact of EfS in her work at the National Environment Management Authority (NEMA) in Uganda. She has 14 years of experience in the communication and education sectors is currently the Corporate Communications Manager at the National Environment Management Authority (NEMA), a public institution that uses information to empower Uganda’s public to actively and proactively participate in the utilisation of the country’s natural resources to ensure social and economic freedom. 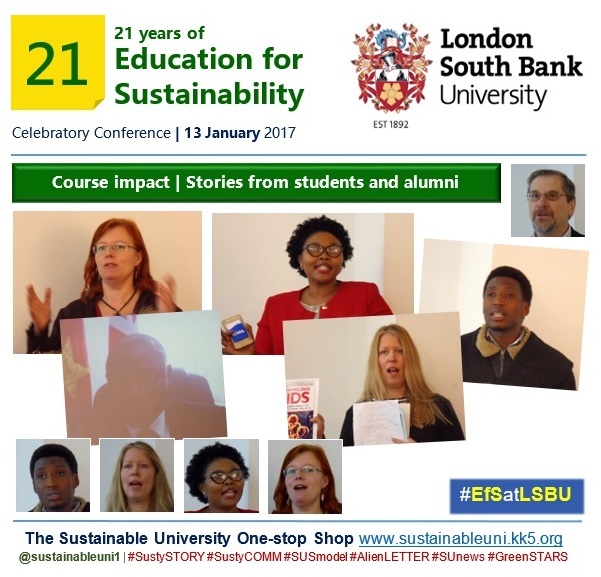 Designed for anyone interested in paving the way for a more sustainable world by way of understanding, educating or promoting sustainability, the Education for Sustainability (EfS) programme at LSBU offers postgraduate courses from Continued Professional Development to Masters level with a range of flexible study modes, including distance learning. It deals with the theory and practice of EfS, enabling students to explore and expand the role that EfS can play in educational, social, political and economic change. The roots of the course lie in the 1992 UN Earth Summit in Rio, Brazil, where a commitment was made to integrate environmental and development concerns in the emerging concept of sustainability while emphasising the importance of education’s role in building a sustainable world. 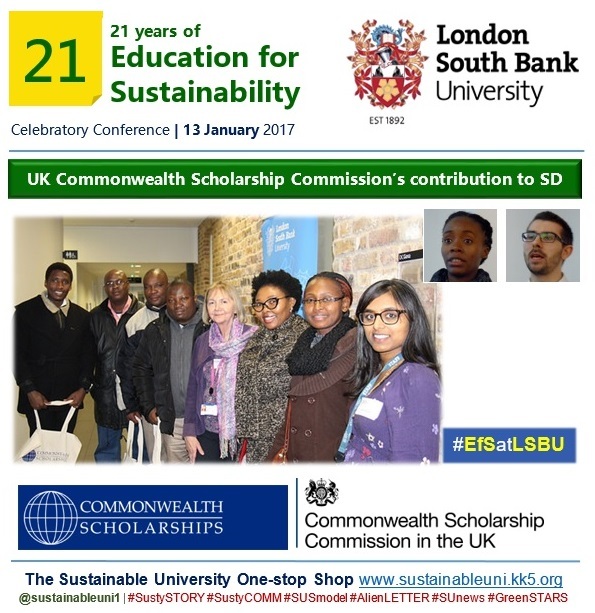 In response to this a group of development and environmental organisations – with the financial contributions from WWF-UK, Oxfam and the EU – got together with LSBU and the eventual result was this EfS programme. Over the last 21 years, the course – the world’s first ever Masters programme of this kind – has continued to grow steadily as a dynamic interface between theory and practice in EfS, both within and outside the UK. 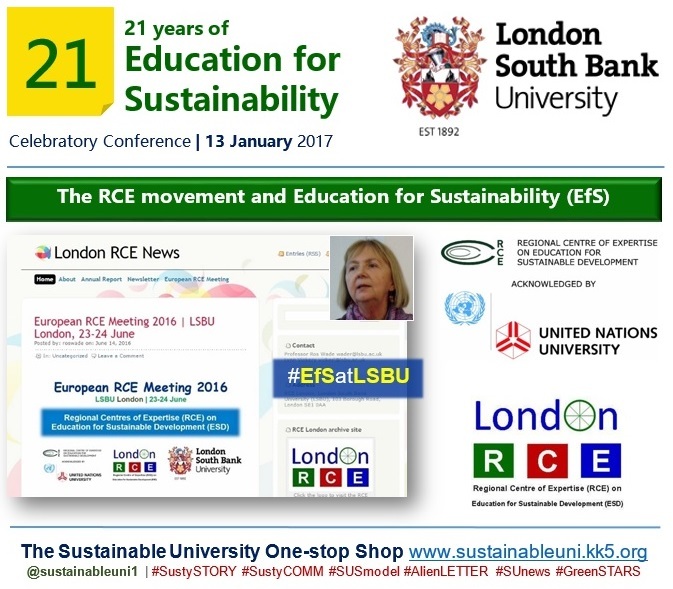 For example, its existence at LSBU has been instrumental in the development of LSBU as the host of a United Nations Regional Centre of Expertise (RCE) in Education for Sustainable Development (ESD), namely the RCE London. The event is free to attend but prior registration is required. Please visit the Eventbrite page below.